RECIPE FOR A PERFECT WEDDING - FAMILY + FRIENDS. THAT'S ALL ASHLYN AND JONATHAN NEEDED TO PULL OFF THEIR SPECIAL DAY. From the Bride: Even before I started planning my wedding, I remember having a friend tell me, "Ashlyn, you need to throw the party of the year, we need a good party around here" and honestly I think that kind of became my underlying goal from that point forward. If I closed my eyes during the planning period and pictured the perfect day, it was a warm and sunny, but not muggy, day with a cool breeze blowing occasionally. Girls had on long, flowing dresses gently blowing in the wind; and the boys had on grey suits looking dapper. But most importantly, I pictured everyone truly enjoying themselves with smiles that conveyed true joy and happiness. And actually, amidst all the chaos and stress that inevitably comes with wedding planning, looking back now...most of those details came true. We chose Maxwell Street Presbyterian for the ceremony, since it reminded Jonathan of Estes Chapel on Asbury's campus. We chose The Apiary for our reception, since I had come across a stunning photo while looking through photos and found out it was taken there. I was instantly in love... that kind of "this is way out of my league" love. After looking at all the pictures and events that took place at the Apiary, I knew I would sell my left kidney (didn't have to though) to have our reception there. When we toured it, we were immediately drawn to the natural elegance and beauty. The chef even blended Jonathan's background of being raised in Costa Rica with my mixed culture of Georgia and Hawaii to create an incredible menu of Southern, Latino and Hawaiian cuisine. This was really special because our guests were able to reminisce on our favorite foods together and I believe this made them feel more connected to our celebration. My friends are still talking about their mini oatmeal creme pies. Choosing my bridesmaids proved to be difficult. The girls I chose to be around me that day were my warriors on the wedding day. They all stood by me and helped me through every aspect of that day, and even more importantly, each of them were SO happy for me and it was so obvious. Pick who you want to be standing up there next to you regardless of their relation to you, it's your day!! 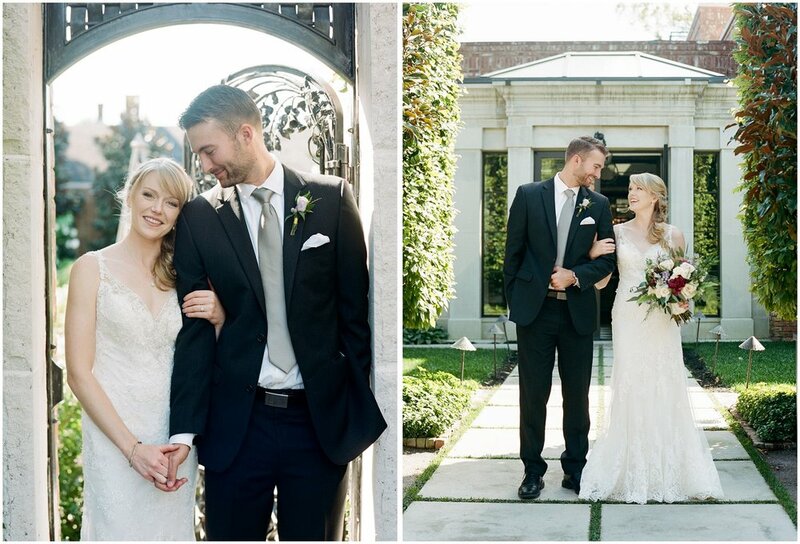 When it came time to choose those long flowing dresses, over and over I was drawn to BHLDN. So, me and my bridesmaids took a road trip to Atlanta. We walked in the BHLDN store and picked out some of the beautiful dresses and styles I liked, and let the girls go wild from there. I'll never forget when I saw them on my wedding day and being taken aback at how stunning they all were. 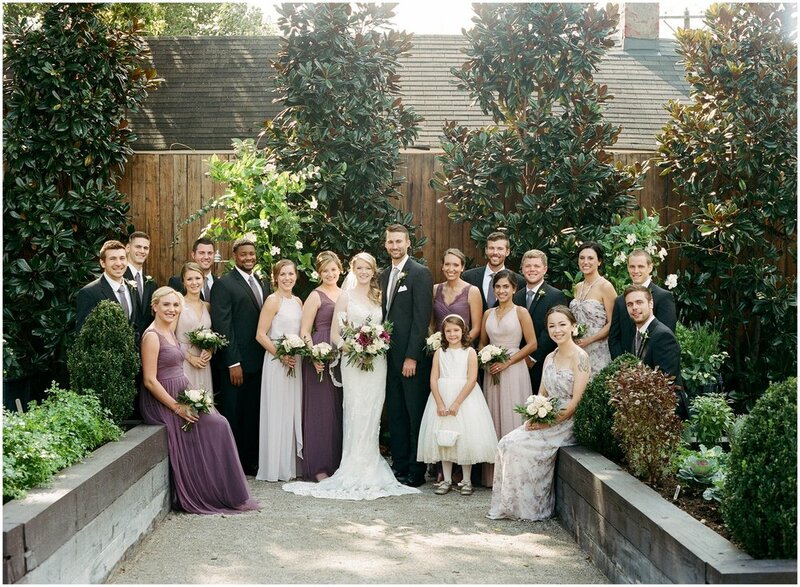 For the guys suits, we chose a slate grey color from Men's Wearhouse with a soft lilac tie that coordinated well with all of the bridesmaids dresses. We wanted Jonathan to stand out from the rest of the guys, so he wore a tan and ivory tie with a white pocket square. Jessica at Blooms N Blossoms did an awesome job of turning my floral ideas and visions into a reality. We used lush pink and purple flowers with lots of greenery, which blended really well with gold lanterns and candle holders to create a soft, natural look. My bouquet was one of my favorite things, it was absolutely gorgeous. I loved that we could play off of all the colors in the bridesmaid dresses in my bouquet to tie everything together. The deep magenta and purple of my bouquet mixed with the soft ivory was just stunning. My favorite moment of the day was the first hour Jonathan and I had together. Our photographers were very pro "first look" and for a very good reason. We had already planned to do a first look, but they suggested we set aside an hour for ourselves after the first look to hang out and take pictures. I'm so glad we did that. All of the pressure was taken off after we saw each other because we could just be goofy and be ourselves without a ton of people watching us. It was so much fun to walk around The Apiary taking pictures and being creative with the backdrop we had. I think it really set the tone for the rest of the evening. My second favorite moment was our family dance off. We initially said it as a joke when talking to our families early in the wedding planning process, but the more we thought about how awesome it would be, the more we wanted to do it. We both bugged our families to death about it and they finally relented. We both choreographed dances individually with friends and family, and then taught to each of our immediate families that would be at the wedding. Then Jonathan and I secretly choreographed a finale together. The days before the wedding, it was so fun to watch our families learn and perfect the dance moves, especially our moms and dads because they actually got really into it. Then, when it was time for the dance off, the energy and laughter was incredible. It was so much fun seeing what Jonathan had choreographed with his family and watching it all play out; and so fun to dance with my family. Then when he and I started dancing, everyone was so loud and cheering and it just made for an incredible start to the night. People are still talking about it to this day. This Polo Barn Wedding Was Full of ALL the Details!